Families living and working in Myanmar can discover an inspiring, safe and welcoming school community at The British School Yangon. The largest city in Myanmar, Yangon is a commercial and cultural hub for the region and home to some of South East Asia’s most impressive colonial architecture. 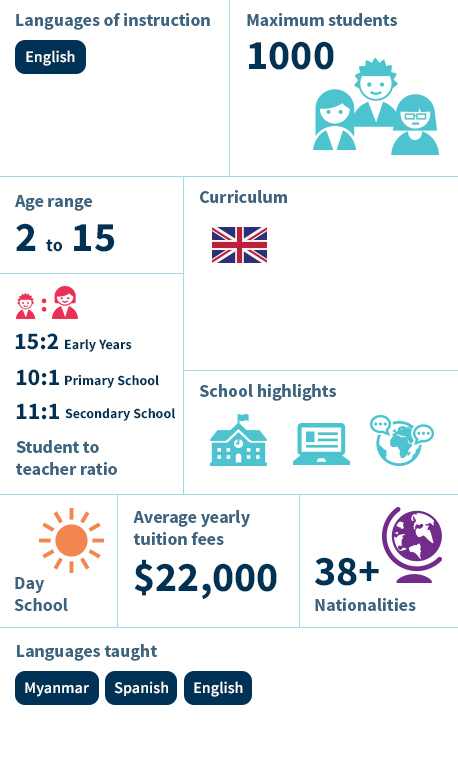 At the heart of it all is The British School Yangon: One of the region’s best international schools. With a new campus opening in 2018, The British School Yangon is an ideal place for your child to learn and grow. Your child will learn tolerance and respect in a welcoming community of more than 40 different nationalities, and will be challenged by a British curriculum that is respected around the world. The British School Yangon (BSY) is one of the leading international schools in Yangon offering contemporary British international education to students in Early Years to Secondary. BSY has become the school of choice for expatriate and Myanmar parents looking to provide their children with highest levels of education in an environment of dedicated teachers, with a focus on a growth mindset.